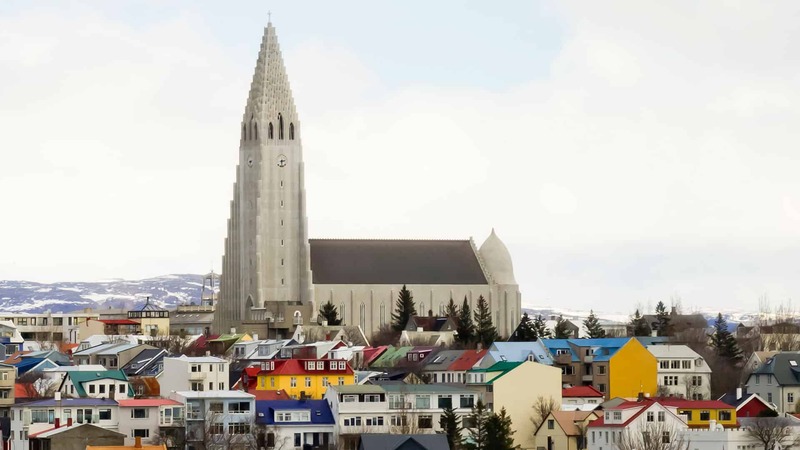 Reykjavik is draped across a peninsula shaped like a dragon’s head, tucked into a sheltered bay in south-west Iceland, with dramatic views of the mountains across the water to the north. The historic core of the capital (known as ‘101’, after the local postcode) lies between the harbour and an inland lake, Tjörnin. Reykjavik is too small to need a metro system, but good bus routes serve the city well. 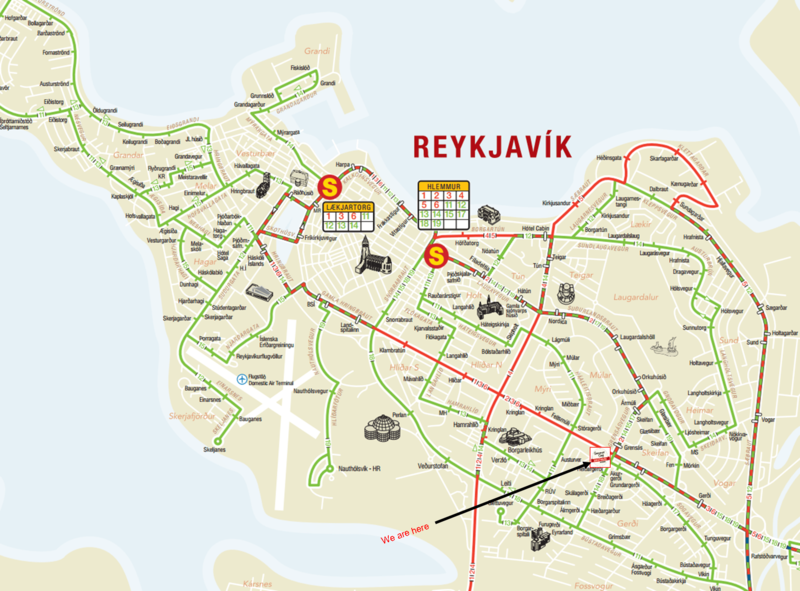 A ‘Reykjavik City Card’ offers unlimited public transport, entry to most museums and thermal baths, and a range of other discounts (4,400 ISK / £22 for 48 hours). The harbourside has been transformed by Harpa, a vast concert hall conceived during Iceland’s boom years. When it opened in 2011 the country was already plumbing economic depths. On any day (from 8am-12am) you can see the way the grid of a thousand blocks of glass teases the light. Follow the waterside west; the earthworks on your left are the original harbour walls. Tourism is gradually displacing industry, as the converted Marina Hotel shows. Where the harbour wall turns north, the Maritime Museum (Sjóminjasafnið) tells the story of life on Europe’s raw edge (10am-5pm daily; 1,400 ISK / £7). Beyond it at Fiskislóð 23, ‘Whales of Iceland’ contains life-size replicas in steel and foam of twenty three cetaceans found around Iceland’s coast (9am-6pm daily; 2,900 ISK / £15). Head up to the roundabout to find the Saga Museum; there are impressive murals on nearby buildings then walk between the colourful corrugated-iron dwellings on Vesturgata. Here you’ll find Pysluhúsið, a kiosk serving hot dogs, Iceland’s favourite fast food (450 ISK / £2). Despite being capital of a country of only 300,000 people, Reykjavik has a remarkable breadth and depth of culture. In the heart of the city, the Hafnarhús is a converted warehouse at Tryggvagata 17 that houses the Reykjavik Art Museum (Listasafn Reykjavíkur) (10am-5pm daily, Thursdays to 8pm; 1,400 ISK / £7). It houses a diverse and startling range of modern works and an explanation of how American artist Richard Serra created his Standing Stones exhibit on Videy Island. The handsome National Library and National Archives of Iceland (Háskólabókasafn og Þjóðskjalasafn Íslands) is now at the Culture House (Safnahúsið) where it traces the island’s soul through poignant words and images (10am-5pm daily except Mondays; 1,200 ISK / £6). The National Museum (Þjóðminjasafn Íslands) at Suðurgata 41 (11am-5pm daily except Mondays; 1,500 ISK / £8), covers the people’s story since humans first came to Iceland. The handsome, theatrical Bjórgarðurinn at the Fosshótel has two dozen beers in strengths ranging from 4.5 to 10 per cent. As winter deepens, you may be relieved to learn it is an indoor garden. On a cold northern evening, Café Babalú at Skólavörðustígur 22 is a cosy place to wolf down traditional lamb soup (1,680 ISK / £8) and cheesecake. A spaceship built from concrete organ pipes sums up the commanding Hallgrímskirkja (9am-5pm daily, free entry). Take the lift heavenwards to the top of the seventy three-metre bell tower (900 ISK / £5). Laugavegur is the nation’s main shopping street. For vintage fashion, track down Nostalgia at No 32 or, opposite at No 28B, Spúútnik. Vinyl music shops are also in vogue, with Bad Taste Records at No 35 featuring a museum dedicated to local band The Sugarcubes. For substantial purchases you can reclaim the VAT. Iceland has harnessed geothermal energy to provide its citizens with limitless hot water. This geological bounty is best enjoyed at Laugardalslaug, a complex of pools on the edge of Laugardalur Park (8am-10pm weekends, 6.30am to 10pm weekdays; admission 650 ISK / £3). The ferry to Viðey takes five minutes (1,100 ISK / £6 return) from the pier at Skarfabakki (1.15pm and 2.15pm), taking you to a windswept isle that doubles as an outdoor art gallery. At the western end is the Peace Tower (Friðarsúlan), a white cylinder created by Yoko Ono. It carries the message ‘Imagine Peace’ in twenty four languages. On your way back to the airport at Keflavík, divert by way of the Blue Lagoon where the run-off from a thermal power station has become Iceland’s biggest tourist attraction. Previous post ← ‘Occupied’: Dangerously Close to Reality?